These tables are hand-crafted in the U.S.A. 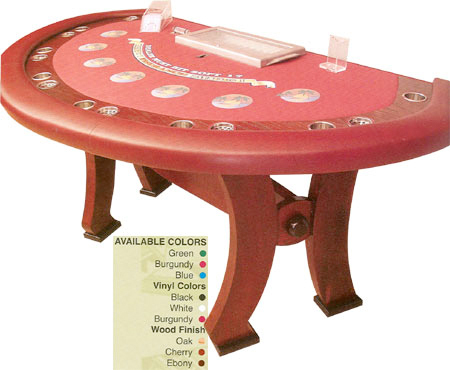 The BJ28246-HT Blackjack Table features "Club/H-Style" wooden legs with matching drink rail, a removable padded armrest, a padded felt playing surface, built-in metal chip trays, a money slot, plus metal cup holders and ashtrays. Four unique layout designs are available - Sunset Beach, Horseshoe/Horse Head, World Map, and Twin Dolphins. Each table measures 82" x 46" x 41." Specialty Layouts Available for this Blackjack Table. Feel free to browse our selection of Blackjack Accessories, Insert Trays, Drink Holders, and more. For more information on all our Blackjack Items, please contact us at 1-800-233-0828.